Mighty Wash is a new revolutionary way to solve your spider mite problem in all stages of development from eggs to adults. 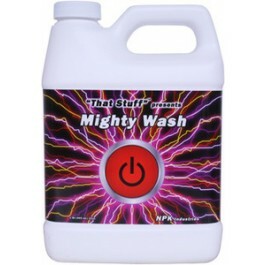 Mighty Wash is a ready-to-use proprietary formula. It may be used throughout the grow and flower cycle up to and including the day of harvest. Mighty Wash is truly "The cleanest solution to your spider mite problem." All washes are contact sprays that are ready to use out of the bottle (do not dilute). At the first sign of problem spray plants leaves, fruits and flowers until complete saturation is achieved. If necessary spray at three day intervals.